Please join Lee Mirabai Harrington and her band for an evening of call-and-response kirtan featuring mantras from the Tibetan Buddhist and Tibetan medicine traditions. This is Lee’s fourth annual appearance at Love Yoga Center and all who participate experience moments of purification, oneness, and bliss. Singing mantras with Lee is an opportunity to connect with your authentic inner self and receive the blessings and guidance of divine beings. You’ll also have the chance to meet and experience some of the amazing members of this community. Don’t miss it! No singing experience necessary or required. All ages welcome. Lee Mirabai Harrington is a vocalist, sound healer, yogi, author and teacher who has been on the path of mantrayana (liberation through sound/mantra) for decades. She has sung mantras for His Holiness the 17th Karmapa at Madison Square Garden and bhajans for Amma at Amritapuri ashram in India. With a background in classical Indian vocals, opera, gospel, and Tibetan medical mantra, Lee leads authentic, high-spirited, and deeply healing kirtans, combining the metta and wisdom energies of Buddhist mantras with the heart-opening euphoria of the devotional Bhakti tradition. Lee’s critically-acclaimed debut album BEYOND THE BEYOND: A MANTRA MUSIC EXPERIENCE (Spirit Voyage) was included on multiple “best-of” conscious music lists of 2016 and placed in the top ten on iTunes world music charts. 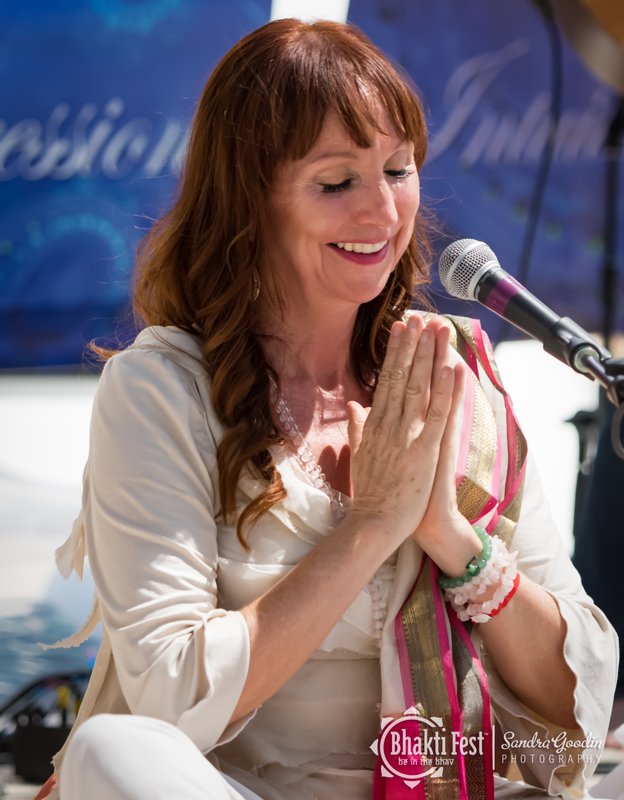 Known for her warmth, wisdom, humor and profoundly healing voice, Lee leads kirtans, mantrayana workshops and “mantra medicine” workshops at dharma centers, spiritual retreat centers, yoga studios and festivals worldwide. She has been featured at Bhakti Fest, Shakti Fest, Ahimsa Music Festival, Sivananda Ashram Bahamas, Yogaville, Omega Institute, Kripalu, Karma Triyana Dharmachakra monastery, Won Dharma Center, and many more. For Lee, leading kirtan is not a performance, but rather a truly spiritual, devotional and healing experience for all who attend. She believes that each of us has the power and ability to heal the self—and countless others—with the power of our own unique voices and through these sacred purification mantras. Lee seeks to heal all beings through the power of sound, and dedicates the merit of her chant offerings for the benefit of all sentient beings.